Add the Corner-to-Corner technique to your crochet toolbox today! Expert Sarah Zimmerman will teach crocheters of all skill levels this fun and versatile technique. Crocheters worldwide have gone wild about the Corner-to-Corner technique! Amazingly, you can master Corner-to-Corner crochet with only basic stitches such as chains, double crochets and slip stitches! 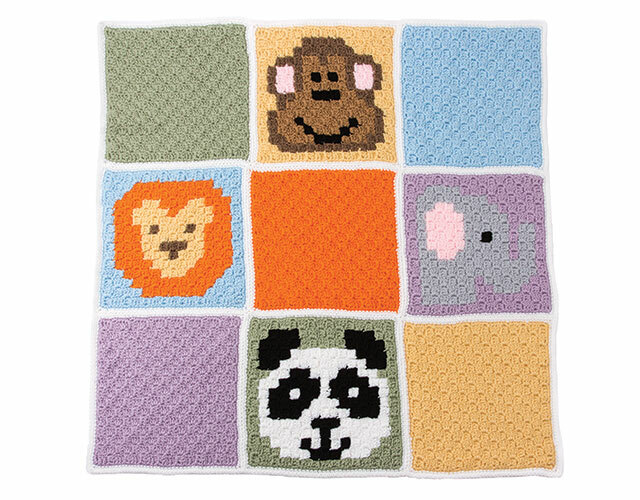 In this class, expert crocheter Sarah Zimmerman will teach you how to read a corner-to-corner crochet graph and combine those simple stitches to create an adorable animal-themed baby blanket. She'll also take you through joining and edging the squares. Work the corner-to-corner pattern to make solid and multicolored squares. Read and work from a graph to create adorable animal squares. Join squares into a blanket using Mattress Stitch. Add single crochet edging to squares and the outside edge of your blanket. Class includes complete step-by-step instructions and graphs to complete a precious animal-themed baby blanket. This special blanket will be the hit of the next baby shower! The lucky parents-to-be will be thrilled to receive such a thoughtful gift. Excellent tutorial, every step clearly explained. Would recommend this class to everyone wishing to learn c2c. Enjoyed class and very easy to understand. However teacher is unresponsive to any questions asked about the class. Very disappointing! This is a great class.The instructor give very precise instructions,I have wanted to learn c2c and I now have 4 blocks completed,am hoping to finish for Christmas present.This is one of the most cost effective projects to learn a new way of crocheting.I would recommend this class to ANYONE who wants to learn c2c.